McCourt Construction is well versed with the complications inherent in bridge and tunnel construction. We have a team of Bridge Superintendents who in recent years have built or rebuilt bridges over highways, surface streets, rail road tracks, and navigable bodies of water. Recent bridge experience ranges from a $2M pedestrian bridge in Boston, MA, to a $22M five-phase bridge replacement over Interstate 95 in Waltham, MA, to a $295M design-build joint-venture that will replace the Whittier Bridge over the Merrimack River. For an example McCourt Construction’s bridge experience, please see our project page for the Winter Street Bridge Project. McCourt also has experience building or rebuilding tunnels under both land and water. 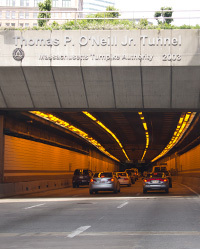 Our tunnel experience ranges from a $2M project extending two culverts carrying a river under Interstate 93, to a $20M project rebuilding the 60 year old Callahan Tunnel through Boston Harbor, to a $280M project finishing the new I-93 tunnel under downtown Boston. For an example of McCourt Construction’s tunnel experience please see our project page for the I-93 Tunnel Finishes Project.